Do you know what activities cost you an unnecessary amount of money? Most companies are not aware what activities costs them too much money. Wrong expense management can affect the company in a negative way. That is why it's really important to locate the main losses and next, try to avoid these losses. 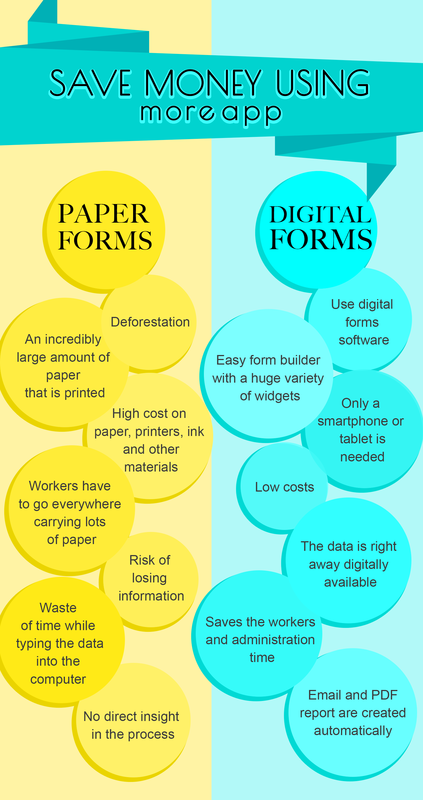 Although it can be hard to believe, there is a huge amount of the company's budget used on printing paper forms so that workers can fill them in. You cannot even imagine how costly this is! You are not just losing money but wasting a lot of time too. With the forms software of MoreApp you will save money, paper and time. All these issues will benefit the company since you can spend more time on other activities and, at the same time, you will help the environment.